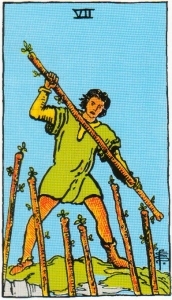 When learning to read tarot cards, the Suit of Wands is the suit of labourers and workers. 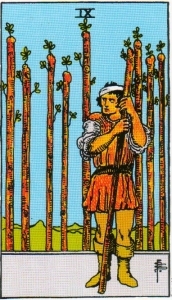 As such, in a reading the card usually stands for the subject’s ambition, career and creative endeavours. 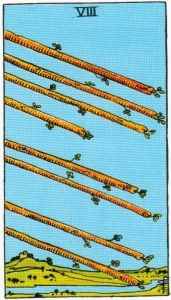 The suit wands also represent passions and ideas, inventions, advancement, growth and progress. The terms Wands, Rods and Staves are totally interchangeable. These interpretations are based on the Rider Waite Tarot but also include relevant comments from other packs and commentators. The italicized comments are mine and from time to time I will expand on them. Also note that I almost always work on the positive of the card. The client for whom the reading is being made will benefit more from being given positives tempered with warnings, than being given a serve of doom and gloom. While each card tells a story, it for you to build your own story lines using the explanations as a guide. After all it should be your own story line that matters. Symbols - A hand emerging from a cloud holds aloft a wand. In the background there is a castle atop a hill. Meaning - Creation. beginning. The start of an undertaking. Fortune, gain, inheritance. Reverse - False start. Cloudy outlook, cancellation of plans. A time of beginnings - marriage, birth or enterprise. The enthusiasm or creative momentum behind the happening. Symbols - A young man gazes out from a castle wall across the sea. 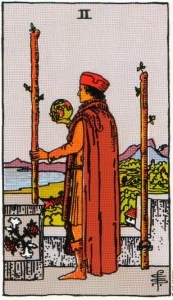 He holds a globe of the world in his right hand, a large wand in his left hand. Behind him is a second rod, and the representation of roses and lilies are pictured on a stone. Meaning - A mature individual, attainment of goals and needs. Courage in undertakings. Reverse - Sense of wonder. Restraint caused by others, loss of faith. In two minds regarding opportunities. The whole world is there for the taking if your subject is up to the task, (or if they really want it)! Be aware that the subject has more abilities than they give themselves credit for. The subject could be in for a pleasant surprise. 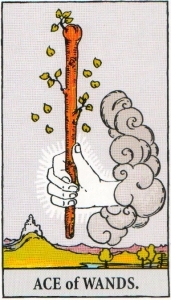 Symbols - A calm stately figure facing away, stands between three rods. He is overlooking a landscape. Meaning - Practical knowledge, business acumen, negotiation. progress is being made. Reverse - Assistance, but with a ulterior motive. Treachery. Beware of help offered. The distant horizon allows the subject to see the whole picture. It is a time for waiting for ones ship to come in. (Many decks have ships in the distance). You have planned and put thing in place, now enjoy watching it all come together. Symbols - A great garland is suspended from four wands. Two maidens hold flowers aloft. In the background there is a bridge over a moat leading to a castle. Meaning - Prosperity, peace, romance. Realizing the fruits of newly acquired prosperity. Reverse - Loss of tranquillity. Unfulfilled romance. Insecurity. Incomplete happiness. The subjects ships have come in. Whatever they have been building, they have established it. This card lays the foundation for the following cards. 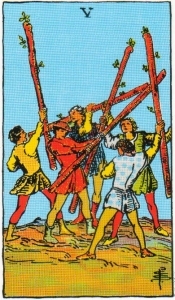 Symbols - A group of five active youths brandish wands as if in sport or combat. Meaning - Unsatisfied desires. Strenuous competition. Reverse - Trickery, contradictions. Cautions against indecision. Strenuous competition for material gains. Don't bite off more than you can chew at this time. Symbols - A horseman wearing a laurel crown carries a wand bearing a laurel crown. Footmen with wands are at his side. Meaning - Conquest, triumph. Good news, gain. Desires realized as a result of efforts. Reverse - Indefinite delay. Fear, apprehension, disloyalty. 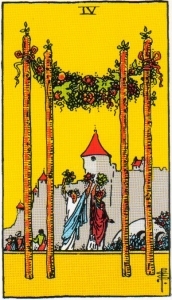 The six of Wands is the bearer of good news. Success is to be heaped upon the subject - their efforts are being rewarded. They will be recognized for their success. Symbols - A young man wards off six attacking wands by using his wand as a quarterstaff. Meaning - Success, gain. Challenges met. Overwhelming odds surmounted. Reverse - Anxiety, indecision. Hesitancy causing losses. Doubt. Courage and persistence will create advantage in business or trade. Don't be afraid of a little competition, stick to your guns. 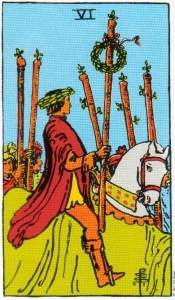 Symbols - A flight of eight wands sours across the open country-side. Meaning - Swift activity. Sudden progress or movement. Reverse - Dispute, jealousy, stagnation. Domestic quarrels. Momentum toward the subjects goals. Concentrate on your outcomes and go for it. Symbols - A figure leans upon a staff and has an expectant or wary look. 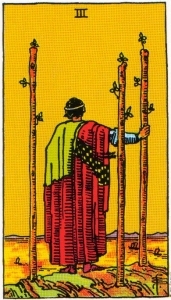 Behind him are eight further wands. Three are to the left of him whist five are to the right. Meaning - Expectation of difficulties and changes. Hidden enemies. A pause in a current struggle. Reverse - Obstacles, adversity, problems, delays. Barriers to overcome. Denotes inner strength focused by opposition. I sometimes 'see' the separated wands in the background as unseen help or opposition depending on the situation. Determination is called for. 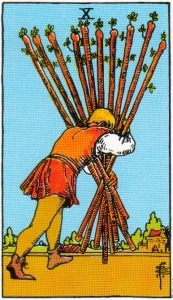 Symbols - A man is burdened by the weight of ten wands as he carries them towards a distant castle. Meaning - Problems soon to be resolved. Striving to meet a goal or maintain a position. Possibly using power or influence for selfish purposes. Reverse - Difficulties. A traitor. Some losses will occur. This is a 'remember to ask for help' or delegate authority card. The subject can't be expected to do everything themselves. Symbols - A page holding a wand prepares to make an announcement. Meaning - A bearer of important news. A person of good intentions. Reverse - Bad news. A gossip bearer. Inability to make decisions. A message about a career move, or possibly a trip. 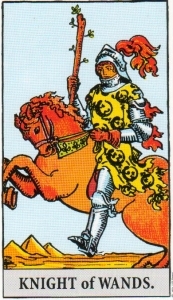 Symbols - The Knight of Wands is mounted on his charger, holding a wand and ready to travel. He is passing three pyramids in the background. Meaning - Departure. A journey. Advancement into the unknown. Possible change of residence. Reverse - Discord. Interruption. Unexpected change. Breakup of personal relationships. A long trip. probably a long one to a new and exciting place. This card represents a person who is always on the go. 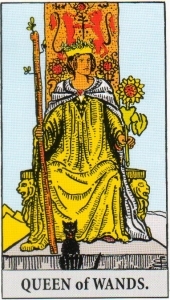 Symbols - The Queen of Wands is seated on her throne holding a long wand in her right hand and a sunflower in her left. A cat sits in front of her. Meaning - A sympathetic and understanding person. A gracious hostess. A person possessing charm and grace. Sincere interest in others. Can lead o success. Reverse - Jealousy, deceit. Possible infidelity. Unstable emotion. Obstacles, opposition. An energetic, capable woman. Likely to take over if allowed to, (or if not allowed to). This is a very positive person who will be helpful, (whether you want it or not). 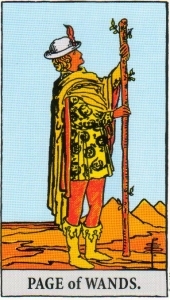 Symbols - The King of Wands is shown in profile. 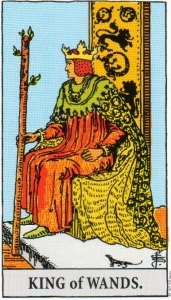 He is seated on his throne holding a wand with his right hand and wearing a flowing cape. His symbol, the lion is emblazoned on the back of his throne. Meaning - An honest and conscientious person. Mature, wise, devoted. A gentleman. Generally married. Reverse - Severity. Austerity. Somewhat exaggerated ideas. Dogmatic. This is a motivational speaker. A person who provides encouragement. He may be looked up to as a leader, but his forte is inspiring others to get things done.